Do you have a role to play in the Decade of Anniversaries? 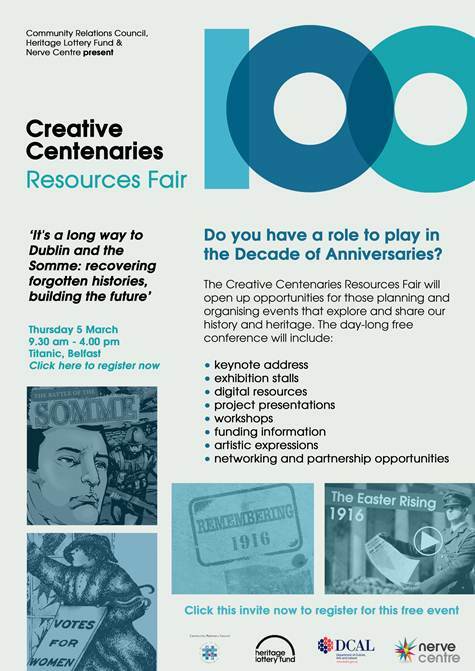 This Creative Centenaries Resources Fair will open up opportunities for those planning and organising events that explore and share our history and heritage. This event is aimed at community and heritage groups, councils and good relations officers, arts and community organisations and others who are organising events across Ireland in the coming years. Delegates will have the chance to hear from a range of projects and exhibitions, take part in engaging workshops, learn about funding opportunities and establish connections and partnerships with others. When registering for the event, delegates will have the opportunity to select which workshops they would like to attend, including: What is Commemoration?, Ethical and Shared Remembering or Creative Responses. What is Commemoration? : This panel based workshop will explore issues such as the purpose you hope to achieve and the long term legacies attached to commemorative events within the Decade of Anniversaries and how this may impact on planning. Ethical and Shared Remembering: This workshop will examine approaches to commemoration including inclusive and ethical remembering and how interpretations of history shape modern society. Creative Responses: This workshop will look at artistic and creative approaches to commemorating and remembering events with the Decade of Anniversaries including theatre, poetry, music and more. 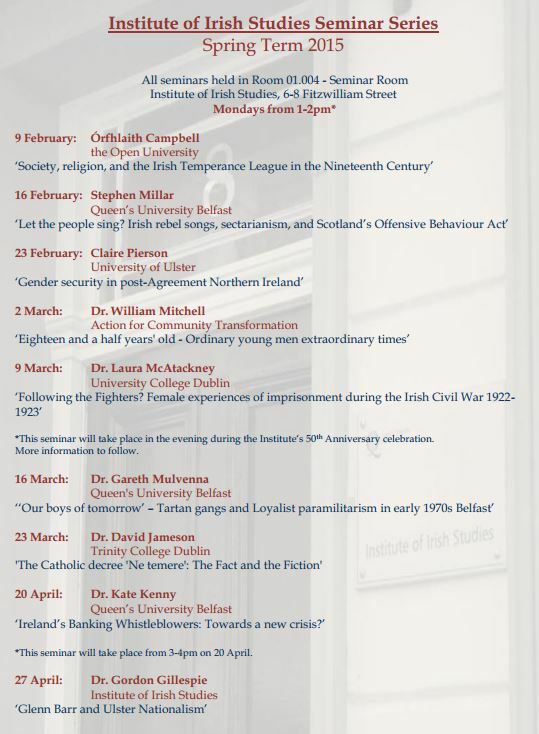 Please find below the Institute of Irish Studies Seminar Series Spring term listings which features History Hub Ulster member Dr Gareth Mulvenna. On 16 March, Dr Mulvenna will present ‘‘Our boys of tomorrow’ – Tartan gangs and Loyalist paramilitarism in early 1970s Belfast’. On Shrove Tuesday 1945, Allied planes drop bombs on Dresden, killing thousands of people, most of them believed to be civilians and refugees. An Irish prisoner of war bears witness to the horror of the bombing and, in post-war years, it prompts him towards an ethic of tolerance and reconciliation. In the 1990s, a young woman whose life has been damaged by the local conflict seeks answers to her questions about the peace process and its ethos of hope, trust and mutual forgiveness. That young woman and that former prisoner of war meet at a reconciliation centre on the Irish coastline and exchange their heart-breaking stories. The Royal Welch Fusiliers Museum in North Wales have an ongoing project to seek out all the Royal Welch Fusiliers who served in the First World War. Many of these men were born in Ireland or lived here. If you have any information about or images of a Royal Welch Fusilier, please let us know. 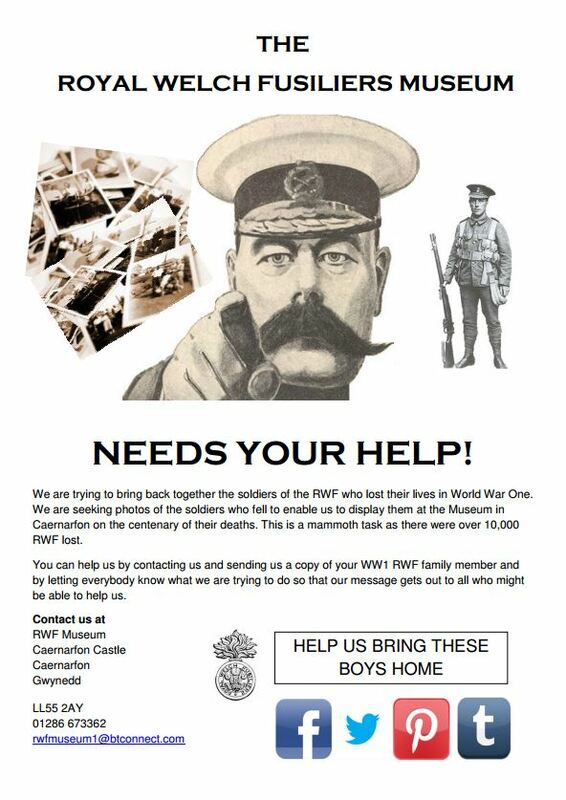 Would you like to play a role in preserving WW1 historical facts for future generations? 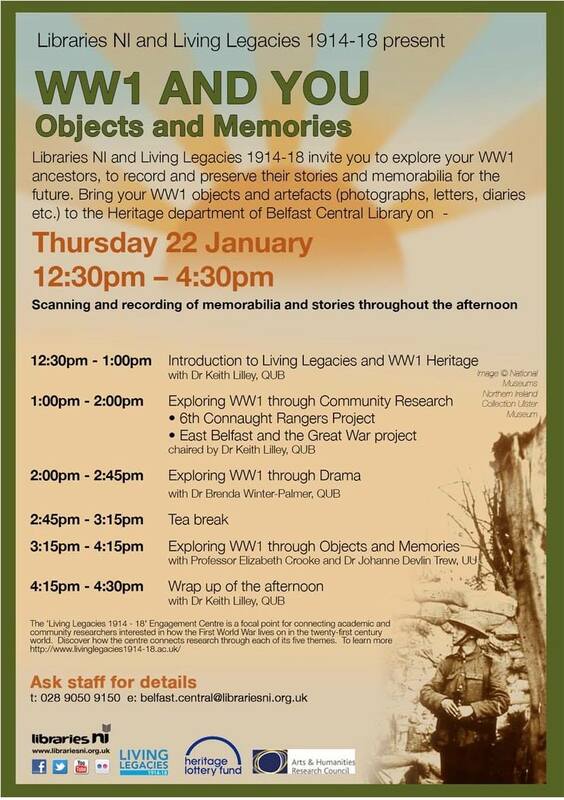 Join Living Legacies 1914-1918 and Libraries NI at Heritage Department, 2nd floor, Belfast Central Library on Thursday 22 January. 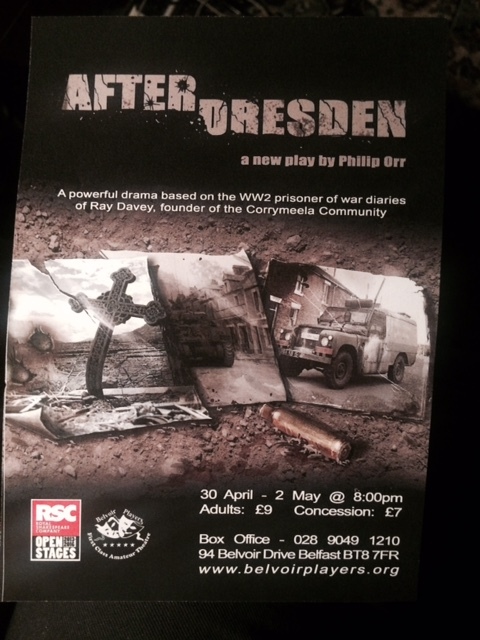 Bring your WW1 objects and artefacts (photographs, letters, diaries etc.) to the Heritage Department where there will be scanning and recording of memorabilia and stories throughout the afternoon from 12.30 – 4.30pm. Also talks by Keith Lilley, Dr Brenda Winter Palmer, Jason Burke, Siobhan Brennan-Deane, Professor Elizabeth Crooke and Dr Johanne Devlin Trew. 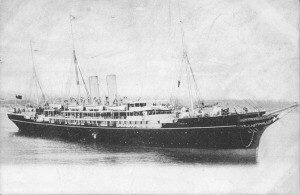 HMS Viknor – an armed merchantman, struck a mine off Tory Island on 13 January 1915. War graves headstones can be found on Rathlin and in the churchyards of Bonamargy and Ballintoy on the mainland. HMS Viknor was a 5386 ton armed merchant cruiser of the 10th Cruiser Squadron, originally a Blue Star Line vessel called the ‘Viking’. 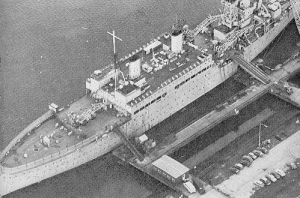 She was requisitioned and renamed by the Royal Navy. 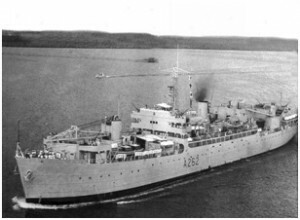 She was under the Command of Commander E O Ballantyne and had a crew compliment of 22 officers and 273 ratings – these were made up of Royal Navy Reserves, 25 of whom came from the Newfoundland Division of the Royal Navy Reserves. On January 13th, 1915 while on active patrol duty in heavy seas off Tory Island she struck a German mine and sank with the loss of all hands. In Bonamargie Friary you will find the grave of Private. J. Griffin, PO 7084, RMLI. In Ballintoy Churchyard the grave of E.R. Hewett, RN J/27300, 1st Class Boy can be found. The following HMS Viknor crewmen are also buried in Northern Ireland: Petty Officer J R Bowering and Greaser L Ogle are buried in Larne New Cemetery and Petty Officer (2nd Class) J J Walton is buried in St Thomas Church of Ireland Graveyard on Rathlin Island. There is a family memorial to Petty Officer (1st Class) J A Blockley in Bangor Cemetery and there are also CWGC Headstones for unknown sailors in St Thomas Church of Ireland Graveyard on Rathlin Island, Bonamargy Cemetery and Larne New Cemetery. Research by History Hub Ulster members Mark McCrea and Nigel Henderson.